The Three Days Grace profile is infinitely higher in the States than it is in the UK. Up to 2012, all four of their albums achieved noteworthy chart positions and a number of hit singles cemented their status. 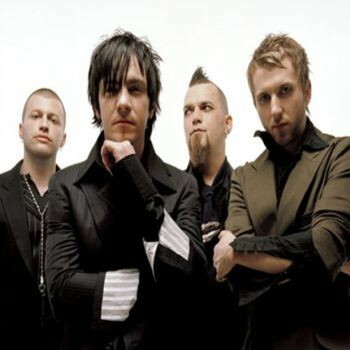 Out of the blue in early 2013 singer Adam Gontier left the band, his place taken by My Darkest Days front-man Matt Walst. Gontier has gone on to form Saint Asonia with Staind guitarist Mike Mushok and TDG have released their first album with Walst, entitled 'Human'. Due to the horrendous traffic and inclement weather I was left with little time to make myself comfortable when arriving at The Ritz and the intro tape was just giving way to show opener 'I Am Machine' as I took my position. The first thing that was noticeable was that the four-piece had been augmented by a keyboard player, but I actually found his involvement during the earlier numbers intrusive rather than complimentary, due to being pushed too far forward in the sound mix. Barry Stock's guitar was secondary to the keys and the riffs emerged only fleetingly, with minor impact. Matt Walst led the line enthusiastically and encouraged the crowd to make themselves heard at every opportunity. The fact the balcony area was closed tonight emphasised what I stated about the band's UK profile, but even though the "Sold Out" signs were not needed the atmosphere is still warm enough to warrant a drink or two. The set was a good mix of old and new; Walst handled Gontier's songs with the same enthusiasm and respect as those from the 'Human' CD he was obviously keen to promote. 'Just Like You', 'Chalk Outline', 'Pain' and 'Break' led into a lengthy version of 'Home' that culminated in a Neil Sanderson drum solo. I would have preferred a couple of proper songs instead but when the drums combined with keyboards it gave things a little more originality. Stock changed guitars regularly and was now sporting a Billy Gibbons amount of facial hair and whilst his solos were few and far between, they did give him a few moments in the spotlight. Matt's older brother Brad's role as bass player was unassuming but integral and his intense expressions were sometimes amusing to watch. 'Animal I Have Become' and 'I Hate Everything About You' received the biggest receptions next to the "radio-friendly" ballad 'Never Too Late' and their popularity generated some generous sing-along moments as well as a mini mosh pit near the stage. 'Riot' was saved for the encore and brought things to a close in rousing fashion, then it was back out into the cold and rain past a number of bootleg shirt sellers who didn't seem to be doing too much business. This was one of only two shows Three Days Grace were playing in the UK and if I'm honest I'd be surprised to see them return in the immediate future. That would be a shame as they have a catalogue of songs to match those of some "bigger" bands who are filling arena sized venues in this country every time they tour.